Salem is a district and town in the state of Tamilnadu, India and popularly known as Steel City of Tamilnadu. 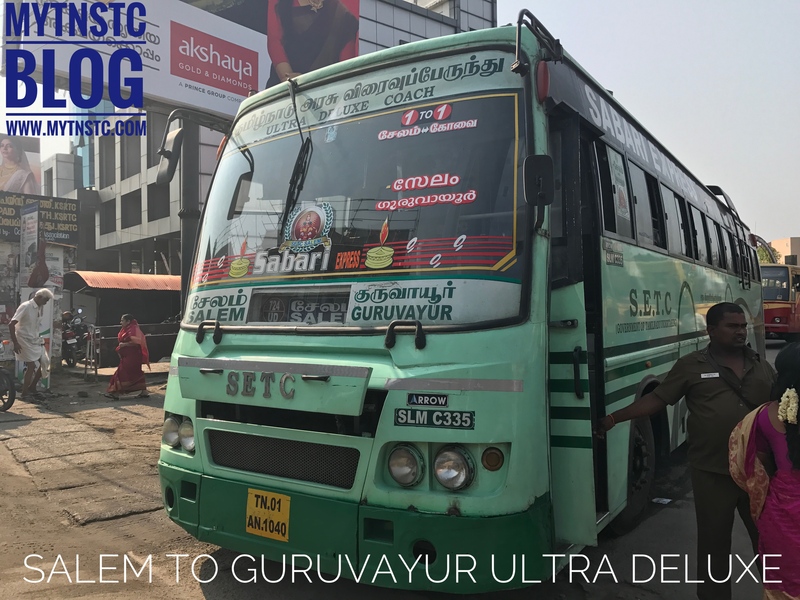 SETC a branch of TNSTC operates bus service to holy temple town in Thrissur District a place called as Guruvayur. SETC operates bus with services such as pushback seats, 2*2 seating and air suspension for comfort ride. The bus service is operated via Coimbatore, Walayar, Palakkad to final destination Guruvayur. The passengers can board the bus at SETC bus central stand at Salem and get down at Final Destination at Kerala State Road Transport Corporation Bus Station at Guruvayur. SETC operates 4 buses in a day from Salem to Guruvayur and fare is 295, reservation charges extra if booked via TNSTC website or booking center. The travel distance from Salem To Guruvayur is estimated at 338 kilometers and journey time of 8:45 minutes on one direction. The bus operated comes under Ultra Deluxe Inter State segment without AC facility. The bus service gives the privilege to visit the famous temple at Guruvayur.